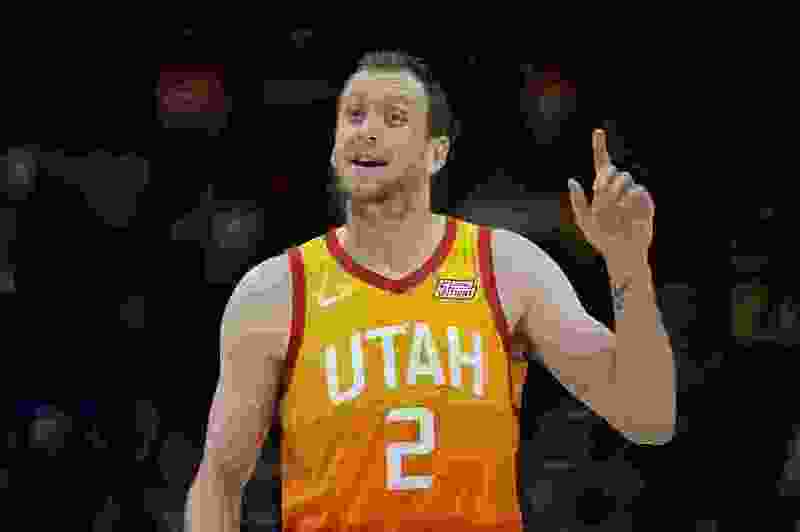 (Francisco Kjolseth | The Salt Lake Tribune) Utah Jazz forward Joe Ingles (2) makes his point with referee as the Utah Jazz host the Denver Nuggets in their NBA game at Vivint Smart Home Arena Tuesday, April 9, 2019, in Salt Lake City. Joe Ingles was feeling fine, and he had it going on. And that was one of the most significant aspects to the Jazz’s only win over the Rockets in their playoff series last year, coming in the second game. As the Jazz try to figure out — after their 32-point defeat on Sunday — how not to get blown off the floor by Houston in Game 2 this time around, it’s worth reviewing some of the basics of their postseason victory over James Harden’s team. To start, the Jazz got help from players other than Donovan Mitchell and Rudy Gobert. In fact, in Game 2, Mitchell did not play particularly well, at least not when seeking his own shot. He was neither efficient nor proficient, scoring a mere 17 points on 6-for-21 shooting, as Houston’s defense built all kinds of resistance around him. Gobert played cleaner, hitting 5 of 7 shots for 15 points. But Mitchell excelled at one thing in that win: He had 11 assists, repeatedly setting up his teammates for shots they actually made. Quite a concept. The Jazz connected on just shy of 52 percent of their attempts, which is 13 percent better than their sorry performance in Game 1 on Sunday night. Ingles was the primary alternative threat, scoring 27 points on 10-for-13 shooting, which included making 7 of 9 3-pointers. Compare that with what happened the other night, when Ingles got all tangled up and couldn’t — or didn’t — conjure anything more than a single made shot. Jae Crowder found his range, too, making 5 of 10, 3 of 6 from deep, for 15 points. Derrick Favors got 10 points, Royce O’Neale six, Dante Exum nine. And there was one other wildcard in that game: Alec Burks, the former Jazz wing who had something that is in rare supply on this Jazz team now. He has athleticism, the ability to go iso-ball, that enabled him to score 17 points on a switching defense, a defense that required him to do some damage one-on-one. He did. Now, Burks, as a Sacramento King, is no option. And the injured Exum, who helped on defense in addition to his scoring, also is a no-go. As much attention as was paid to the way the Jazz guarded Harden in the first game of the current series — playing him from the side and behind on the perimeter — it only wound up putting Gobert in a tough spot as tried to stop both Harden’s drive and his initial defensive assignment. All the while, Harden shot floaters over Gobert or hit an open teammate with an assist. Yet, it was the offensive end that was in need of even more repair. In the first game, the Jazz’s motion offense got jammed up by the Rockets’ infamous switching, and the result was 18 turnovers and only 17 assists. In their Game 2 win last time, the Jazz still had 17 fumbles, but they garnered 26 assists. There are two ways of looking at that. Either the ball movement put the Jazz in favorable positions to hit open shots, or the Jazz hit open shots and thereby made the passing appear timely and effective. It’s obviously a lot harder to stack up assists when guys are chucking bricks, easier when they dust the net. On Sunday night, the Jazz looked uncomfortable, and even worse, unconfident. It made you wonder whether all the postseason losing to the Rockets is playing on their minds. It did not mess with them in Game 2 last season, especially with the help of Burks’ sometimes unpredictable, herky-jerky, scrambling contributions. His movements were too rapid, too automatic and gung-ho for him to worry much about the results. He made 7 of 11 shots and was perfect from the foul line. Enough for the Jazz to gain their one moment in the series sun. Another aspect to that win: The Jazz led for most of the game, taking at one juncture a 19-point lead, avoiding the predicament they’ve suffered too often in defeat, where they fall behind early and spend too much effort and energy trying to climb back into contention. They led by eight after the first quarter, by nine at the half, fell behind briefly in the third and fourth quarters, but finished strong, outscoring the Rockets by seven in the fourth, winning by eight. Harden and Chris Paul combined to score 55 points in Game 2, Clint Capela got another 21, and none of those points mattered, on account of the Jazz’s assured showing at the other end. And the question of the present is: Can they do it again? And again? And again? And again? GORDON MONSON hosts “The Big Show” with Jake Scott weekdays from 3-7 p.m. on 97.5 FM and 1280 AM The Zone.